How Involved Should A Bride Be With Her Bridesmaids? A few months ago, the post about the Maid of Honor’s role in the wedding party was a hit among Yentas readers and helped explain the duties for women waiting in the wings to fill those shoes. The article talked about her MOH as the bride’s personal heroine of the wedding — the one who helps saves the day should anything go wrong or requires assistance. What the article did not touch on was a bride’s role in the wedding party as a whole, and how much of a role, if any — other than showing up, looking pretty, and saying “I do” — she should have with the other gals. The post received a comment that is worth addressing for all to read as it is something I wondered as well when I was a bride. This is quite a job! Why do I feel such guilt about putting so much work on a friend’s shoulders? How much involvement should a bride have with the bridesmaids beyond choosing them? Thanks, Bride-to-Be, for your question and sharing your thoughts with the rest of the Yentas. It’s not easy to be waited on, hand and foot, without any guilt. Even if it’s someone’s job — as it is the MOH’s — it’s difficult to accept such generosity and good intentions. I say, accept it with grace! This is an appropriate time to count on your best girlfriends, especially your MOH, for anything. The day only happens once and the months and events leading up to it are a snapshot in time. The year-ish of wedding planning is not forever so the generosity and good intentions are really, actually, short lived. Also, a bride picks these special women not because they’re pretty and make great arm candy to the wedding scene. Okay, maybe that, too! But, really, a bride picks these special women because she knows she can count on them, she has a history of happy memories with them, and considers them to have long term presence in her life. If they were fleeting friends or unreliable women, a bride would — hopefully — not have picked them. Most likely, each friend serves a purpose. Maybe there’s the quiet listener who will provide the platform you need to share your ideas and feelings. Maybe there’s the funny one who will distract you when you’re stressed. Maybe there’s the crafty one who will help you sort out your creative ideas. Maybe there’s the knowledgeable one who’s been a bride before or has an inside understanding of weddings. The Maid of Honor is the one you can count on, no matter what. And of course she doesn’t mind doing her job. In fact, it’s an honor. It’s in her title, after all. So how much involvement should the bride have with her bridesmaids other than choosing them? Well, that depends on the type of wedding, girlfriends, and bride. Generally, I would say that the bride can give input to her MOH who is the Commander in Chief. For example, if a bride wants to make sure that her bachelorette party is not a chippendale’s fling fest and would prefer a tame and more G-rated spa day, then that would be a good reason for the bride to get involved. Should she plan the whole spa day down to the last cucumber water and hot stone? No, no! It’s okay to hint at what she wants, but it’s not okay for her to take charge and plan everything herself. Otherwise, what’s the point of having the support system? When it comes to bridesmaid wardrobe or dates for events, the bride can again assume that her MOH will liaise with the rest of the party. The bride can tell the MOH the information about which shoes to purchase or the hair stylist’s rates, but she can just as quickly tell the MOH the information and then forget about it because her trusted confidant and partner in wedding crime will deliver the messages to the other gals so the bride can focus on her other lists, decisions, and ideas. The bride can be involved, however, to show gratitude and appreciation. Thanking them through emails and words on the day of the wedding will always be welcomed. 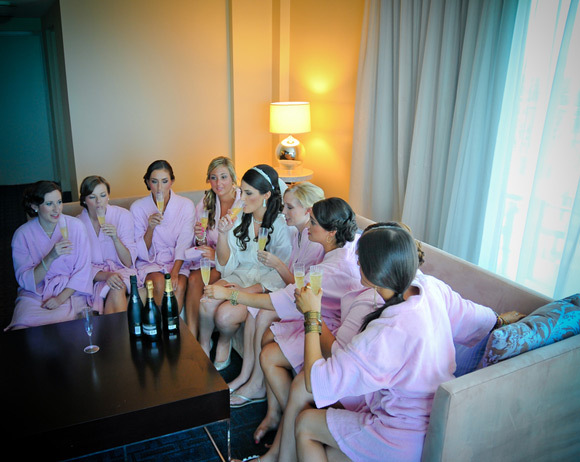 The positive experience that the bride creates for her bridesmaids will provide a positive experience for everyone. So, brides, do not feel like you need to be busy with bridesmaid business. You chose these girls because you can count on them. Therefore, count your blessings on the way to the chuppah and they’ll be there to greet you with smiles and love.